Bright and cozy lower unit cottage offers lots outdoor living space and beautiful views from the large deck. For over a decade, both the upper and lower units have been rented to long term, year round tenants. We have decided to open up the lower unit for seasonal and short term rental so that we can enjoy it ourselves! The bedroom has a queen bed with a dresser, armoire and desk, as well as an air conditioning unit. The bathroom (accessed through the tv room) has a full sized shower and toilet. The tv room is equipped with internet, a flat screen tv and cable with a sofabed. The kitchen has full sized appliances including an oven and refrigerator, as well as amenities such as a mixer, toaster oven, microwave, coffee maker. The kitchen is equipped with dishes and utensils to meet all your culinary needs. Fresh linens and towels are provided and a washing machine is on premise. The deck has a gas grill with outdoor patio seating. I was born in the midwest and have called Colorado my home for over 20 years. My wife and I are raising three boys. Over 25 years ago, I took some friends up on their offer to come and visit St. John and the Virgin Islands. Instantly, I felt drawn to the natural beauty of the island and knew that it was somewhere that I'd always want to come back to. I stumbled upon this property way back when and its been a labor love ever since! Cable tv and internet WIFI through the local carrier, Innovative. Disclaimer about WIFI: Please do not expect the same level of service that you may have at home with WIFI and cell phone coverage. Power outages are more common and some telecom carriers don't have the best coverage on island. There is a different pace to life here and no hurry to get these things up to speed. 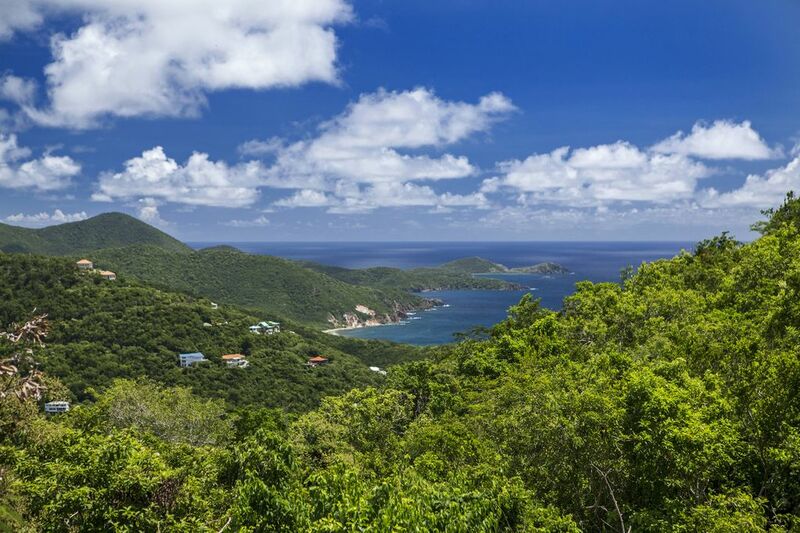 We do our best to maintain access for our guests, but it's a different state of mind in the Virgin Islands. This was our first vacation on St. John! The island is absolutely beautiful with world class beaches and views! Mountain Breeze Cottage is nestled atop of Gift Hill and offers a beautiful view of Reef bay, to the White Cliffs, to Rams Head Peak. Sunrises and Sunsets are quite a sight. The cottage is very relaxing and there is a cool breeze that constantly blankets the property. We didn’t use the a/c at all, and instead, opened the windows to let the breeze in all day and night! The owners left some chips, salsa, sodas, and lunch meats for us which was very much appreciated after a morning of travel. We have nothing but positive things to say about Mountain Breeze, just make sure you take the road in slowly, as it is very rocky and uneven. If you use google maps, just search “ Mountain Breeze Cottage”, and it will take you directly to the house. I updated the location on google maps while we were there! Until next time Mountain Breeze! Amazing view, great location, everything you need for an amazing stay. There is even a grill incase you want to eat in for the night. Amazing breeze and sunrise. The cottage was well equipped and in a great location. Very private and great views. Would definitely book again! Mountain Breeze was well-equipped and comfortable. We enjoyed waking up to the spectacular view, which is just as pictured but changes by the hour with the angle of the sun. The location high on Gifft Hill keeps the trade winds blowing and the mosquitos at bay. But the wild roosters may wake you up! (Which is true anywhere on the island.) The short dirt road leading to the house is best navigated with a Jeep. The apartment still has a few issues resulting from the hurricanes, but nothing that impacted the pleasure of our stay. The owner was very responsive whenever we had a question or concern. St. John offers gorgeous beaches with the softest sand imaginable and spectacular snorkeling just feet from the shore. I had a wonderful time. Thank you for the Welcome package. My flight was delayed and I missed dinner. I was hungry and exhausted when I arrived around 11 pm. Your package got me through that first night and the next day until I could get the rental car and locate the market. Thank you also for the providing beach chairs , coolers and towels that made the trips to the beach more enjoyable. The maps and guidebooks were also very helpful, but I could have used something with a little more local information - I wasn't exactly sure where the local trash dump was located. Do you have a list of your favorite Taxi drivers ? How often do the buses run? It was days before I realized a bus stop was in walking distance of the property. Public Transportation or Taxi might have been a nice alternative to driving . We got wonderful dinners from a little place up the road . I loved staying in a neighborhood and not in a tourist trap, I just wished I had had a little more information. Please forgive me if you had that information somewhere and I didn't see it. Overall, I had a wonderful time. It was exactly as advertised. I will miss sitting of the deck , listening to the sound of the mountain breeze, seeing the chickens, deer, cats, geckos and iguanas ,or seeing the stars at night. For me, it was a little peace in paradise. We had a wonderful stay at Mountain Breeze Cottage. A seperate check can be written for the security deposit that will be cashed only if damage is sustained.